The market is speaking, and it seems to be saying this: The Canon 5D and Nikon D200 are all but taking over as the "effective flagships" of their respective lines, by offering ~85% of the performance of the cost-no-object pro 1Ds mk. II and D2x cameras in substantially lighter, handier, and less expensive bodies. Another down-shift in the camera market? Perhaps. "Smaller, lighter, and less expensive" are surely things that the pro and advanced amateur camera markets have been asking for, and there is almost nothing that professionals have asked for from digital cameras in recent years that they have not gotten: ever-increasing megapixels, better and better high-ISO performance, larger and more reliable cards, longer battery life, improved responsiveness, deeper and faster buffers—and lower prices. All that is good, but is all good? Not quite all. As with any emerging technology, there are substantial "accidents" in the market as well: ways in which the market evolves that are neither intelligent nor guided strictly by demand (or else guided by demand that is partly wrongheaded, for example, the "full-frame sensor" shibboleth). Some factors remain "hidden" or "masked" and are neglected, while others become prominent and therefore get attention. An example of the latter is something I've been saying for a number of years now, which is that photographers should thank their lucky stars for the extremely poor longevity of early inkjet prints. What that did was shine the spotlight of consumer attention on print life expectancy (LE) and force the manufacturers to address the issue. (The presence and the influence of longtime industry gadfly Henry Wilhelm was a significant factor in our favor as well.) We have been rewarded by forthright competition in this respect, which has produced excellence: the best inkjet printers and ink/paper combinations are now surpassing the best-case LE for color photographs, historically, and are beginning to effectively rival even black-and-white print LEs. Bravo. Had early inkjet prints commonly had LE's of, say, 20-30 years, no one would ever have paid any attention to it and we'd probably still be stuck with those numbers today. But there are ways in which we lose, too. Sensor manufacture (and/or access to same) has introduced a new bottleneck into production and profitability that has forced several longtime cameramakers to quit the field. Dynamic range has not received adequate attention. Standardization, despite the heroic efforts of Olympus (and the recent bright spot provided by Panasonic and Leica), has stumbled. Black-and-white printers continue to be an afterthought, with ultimate quality that is as far behind traditional black-and-white as the quality of digital color is ahead of traditional color. One mechanism by which we lose—or get on to a losing track—is that market failures tend to have a disproportionate effect on their underlying technical ideas, even though those ideas may be sound ones, and even though the failures of the product in question might have had nothing to do with the viability of the idea. For instance, one way in which are losing is that so far, pocket cameras are being made exclusively with tiny sensors. If Sony's R-1 fails (I have no idea how well it's selling), then the supply side—ever "conservative," a.k.a. skittish—will conclude that large sensors in fixed-lens cameras are a bust, and will continue the arbitrary current schism between small-sensor digicams and large-sensor DSLRs (created in the first place largely because pocket camera buyers are simply ignorant of the issue of sensor size altogether). Whether the markets evolve that way remains to be seen. The situation with regard to sensor sizes, lens coverage, dust, lens size, IS/VR/AS, and lens cross-platform interchangeability is still volatile and fluctuating, but one pattern that is emerging is that we are simply not going to get adequate lines or ranges of prime (single-focal-length) lenses in most digital systems. This is due to two things. First, legacy 35mm lenses can be used. And second, because of one of those "hidden" factors I mentioned earlier: flange distance. In Canon, Nikon, Pentax and presumably the upcoming Sony (from Minolta) DSLRs, flange distance is a legacy specification, a holdover from 35mm. 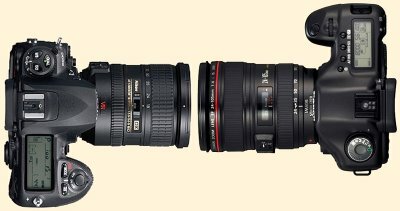 It means that fast prime lenses will still need to be more or less as big and heavy as 35mm versions, and have objectives [think "filter size"] that are more or less as large, despite the smaller coverages. This is a loss. Many legacy 35mm primes are not quite adequate for several reasons—one of which is that digital lenses need to be coated differently. Digital sensors are much more reflective than film, so lenses for digital need to be coated against light impinging from the back as well as from the front, not just from the front. This is why "digital ready" actually means more when referring to lenses than it did to, say, stereo speakers. Posted by: MIKE JOHNSTON, tip o' the hat to O.G. and C.W. A bit of a cranky, curmudgeonly aside: Please don't comment on this post unless you have first bothered to peruse it. Skimming content on the web is a regrettable necessity, but it often leads people to reach "closure" too easily. ("Closure" might be defined as the premature shutting-down of input in response to the belief that the input is understood.) It was harder for me to write this than it is for you to read it, so comments responding to what you think I said rather than what I actually said will be given somewhat less toleration than usual, if only because I don't feel like responding in detail to misreadings. Yeah, I know, I'm a grumpy old man. Progress has been painful, very painful. It used to be that we were good at one thing and average at another, and we recognized that fact. People that were good photographers and good darkroom workers are few and far between. Now we are expected, and expect from ourselves, to be experts on all areas of photography, from the underlying electronics in our cameras, to the chemistry of inkjet printing. We must do it all ourselves. How many people actually printed 11x14 color prints themselves before? Almost nobody. Why? Because it was expensive and complicated. Well guess what, in this digital age, printing 11x14's yourself is still expensive and complicated. Color management has become an obsession, with this color space against that color space, printer and monitor profiling, this brand of ink against that brand of ink, and so on and so on. And it has come to the point that if you are not an expert in all the phases of photography, you can't possibly be a good photographer. It's like the old joke about asking the photographer what camera he uses when looking at a photo, (akin to asking a cook what brand of pots he uses) but expanded to what computer, what printer, what monitor profiler, what paper, what resolution, what RAW converter, what color space, what method of color space conversion, and so on and so on. How often do we see incredibly boring photos by people that have 'mastered' the digital workflow? More often than not. I had an interesting conversation with a group of photographers just a few days ago, in which they were generally pooh-pooh'ing the fact that I send out my client's printing to a lab instead of printing the retouched digital files myself. So we talked about costs and difficulty... most of them are still experimenting after 1000's of dollars, multiple printers ("the last printer you will ever need!... for the next 6 months"). Then the critical question came along... given what you know about inkjet printing, would you want your wedding photographer to provide you your wedding prints made on his inkjet. After some thought not one of them answered yes. The fact is that nobody trusted some other guy to create inkjet prints that can be trusted... since we all have been burned before. Although I haven't read your post, from the title I infer that you are discussing some sort of sporting event. Is that really appropriate material for this blog? I want to read about photography, not sports. One of the items that has continued to amaze me about the conversion to digital is that some manufacturers have almost completely ignored how lens conversions have effected the lenses they offer. Canon at least addresses this issue by making a relatively inexpensive full frame camera available. But step down from the 5D and you're back in the same boat. And well I'd seriously consider getting a digital rangefinder (I miss my M6, it just sits on the shelf) it would have to be full frame. Otherwise the lenses just don't do what I want. Which leaves the problem I think that also needs to be looked at on digital cameras, the angle of incidence that the sensors can handle. If light came in at very oblique angle on a piece of film, no big deal, but unless digital sensors get to this point, my rather nice m-mount 21 is going to be quite useless. And unfortunately I don't think Leica has the money left to invest the R&D dollars into this problem, the DSLR manufacturers don't have to because they've been dealing with those mirrors for years, and Leica isn't going to design a whole no set of lenses for their 1.37x sensor. Oh well, enough rambling. Just been a pet peeve of mine for the past few years I guess. Mike, say "howdy" to Nick next time you see him. Just wish I could write and express my ideas like you. Excellent analysis. I would love more R&D on dynamic range. That would be wonderful. I'd also like to see some alternatives to the single-chip, bayer pattern technology that almost all cameras are using. The loss of detail really bothers me. I agree with most of what you said and also have to agree with unbound in that the whole workflow contains far too many undefined variables and standardisation is urgently needed. It's just as non-trivial to get really good prints from digital data as it is from film. Also Minolta has shown that image stabilisation *can* be built into a DSLR body and I think the other manufacturers, in particular Nikon and Canon, ought to do the same. Of course they've got something to lose, namely the sales of their IS lenses. BTW, I'm one of those still shooting film because in my opinion digital can still not match it (ducking into cover) but have the same, or even more of the same, problems with the analog-digital-analog workflow, i.e. scanning, processing, digital printing - on analog material because if you look more closely you will find that the procedures for measuring print longevity are significantly different for inkjet prints and analog prints, and not really comparable. Inkjet is getting better all the time but in absolute terms traditional analog prints still win hands-down - with regards to longevity, that is. josh, leica is making new wide angles along with the digital m. they will cover 35mm, too. i wish they'd leak what focal length and speed they will be. A very astute analysis... I wonder what kind of wedge issue we could "create" to force them to think about dynamic range? i think it's going to take a company like Leica to do something radically different with digital cameras. in this case radically different could simply be the carryover of what they have always done into the digital world. i have not looked forward to the arrival of a digital camera before like i have the digital M.
regarding digicams with larger sensors, it's unfortunate that the analog camera companies that might have done something innovative like that have all but dissapeared(would have been neat to see a digital T4 Super). i don't expect canon or nikon to do it, at least not until their dslr sales have obviously flattened out. i think Olympus should consider making something like a digital XA with a 4/3 sensor, that would be hot. Pentax bears mentioning yet again in these comments, because they are presently making lighter primes designed specifically for their digital cameras and it looks like they're going to be pushing farther into that realm. Right now, there's not just the DA 21mm pancake coming out, but a DA 40mm pancake that's been out for a while. Both are designed without an aperture ring (the user controls the aperture just fine from the camera). I would also contend that all the limited prime lenses Pentax released over the past year are light and small enough to be considered designed for their digital line-up, with focal lengths best suited for an APS-C sensor (77mm f1.8, etc). It used to be that I would shoot some 35mm slides or negative film, take them into a lab I had grown to trust and some time later looked at what I had done. Occasionally I liked someting enough to enlarge, frame and hang it up. These were a mix of 5x7's, 8x10's and 11x14's. It was nice that someone else did all the calibrating and system maintenance and I thought I got good value for what I paid them. As an amateur, my expenditures on film and development are not onerous. For the moment, I can still do that, but I have this nagging feeling that the affordable film-based photo service sector will soon go away and I will have to migrate completey to digital, or that, at least, it will easier to do so than to not do so. (BTW, I use a 4 mpix digicam too.) This will cost me a ton of money and increase my post-processing workload, especially since I used to have almost none. I will need more disk space and worry more about back-ups. I will also have to calibrate monitors and buy yet more software. And buy more expensive cameras. I am very much hoping that the cost of the D-SLR's will start to come down A LOT soon. Already, the price of a 4/3's system Oly camera with 2 lenses is more or less reasonable, given the quality. Still nowhere near the price of a Pentax MZM, though. On the net I read about how only the best lenses can be used with some of today's D-SLR sensors. Is it relevant for me? I don't know, but I do know that it will cost me a lot of time and money to find out. When the transition is complete I will be able to put the occasional 5x7, 8x10 or 11x14 on my wall. Am I a winner or loser? The jury is still out. But after living for 5 decades, and being part of the generation that came to venerate "new", I am beginning to have my doubts that everything new is good. It is usually good for someone, especially the people selling me stuff, but it is not always good for me. The digital revolution has been a boon to professionals, I believe. It's provided amateurs like me with a lot of new toys to play with, no doubt. But I didn't want new toys. "Standardization, despite the heroic efforts of Olympus (and the recent bright spot provided by Panasonic and Leica), has stumbled." What is heroic about Oly's marketing effort with 4/3? Take a hard look -- you'll see that it isn't much of a standard. Try to "join" this standards body or get specs or licensing terms. Let us know how it turns out. For those that have tried, it becomes quite obvious that 4/3 is a standard in marketing speak only. It's a private party requiring an invite; hardly what I would call a standard. A fine move by Oly for sure, but nothing heroic about what they are doing. As for new primes for digital, Pentax seems to be making some effort in this area, with the new 20mm, 40mm and 70mm limited digital lenses. What pentax needs a good body to attach to the back of those lenses, as sadly, the camera body does matter these days since the "film" is built-it. I switched from Pentax to Nikon just before going digital (partly so I could run down to my local Calumet and rent lenses, something that isn't an option for Pentax), but if I win the lottery I'd think about getting a Pentax setup just for these new digital primes. Next topic: B&W digital printing. I've been thinking about this a bit lately since I recently lost access to the darkroom I'd been using. As Mike pointed out, for color work digital certainly seems to be the way to go these days (at least vs. 35mm film), but I haven't been very happy with the digital options for B&W. Nothing seems to work as well as a real silver print on fiber paper. About a year ago, Mike wrote an SMP column on the Epson C86 with the EZ ink from MIS - at the time you said it looked pretty good, any update on how that has held up over the last year? I'm guessing you're not happy, given the comments on B&W printing in this point. Finally, to Ronald, current 35mm-style DSLRs use a 3:2 ratio, like 35mm which is pretty close to 16:10. As to whether the smaller format stuff should/will move to that in the future, I have no idea or opinion. He basically says that the best prints he can get in any form are inkjet, and by a nice margin too. And this guy is no slouch in a darkroom. "In Canon, Nikon, Pentax and presumably the upcoming Sony (from Minolta) DSLRs, flange distance is a legacy specification, a holdover from 35mm"
But this could be a blessing too, in that the lenses with current sensors need to have more straight lines of light. The 4/3 lenses are also pretty big, despite the much smaller format and being designed for digital. And the Epson rangefinder has issues with vignetting. This may be the lenses rather than the lens/sensor distance, and we may see compact lenses which solve it, but I'll believe it when I see it. 1.5x APS-sized sensors is the future? Popycock! And... you consider yourself an experienced 35mm photographer? Regarding Brooks's article about the Epson 4000--bear in mind that he's starting from scanned LF negatives. No, APS-C *and* medium-format digital sensors are the future. And yes, I'm a very experienced 35mm photographer. Why? For what it's worth, cranky old man, this continues to be the best-written blog - on any subject - that I read. As a writer first and a photographer second, that's important to me, and it's what keeps me coming back. It doesn't really matter if you are old, i admire the way you express yourself, i think i've learnt from you. I forgot the other thing I'd love to see: sensors that have response similar to black and white film's toe and shoulder. Or at least something a little less linear. It would be great to dial in flatter response in the highlights, or something like that.